Stacy Tilton Reviews: Are you ready for a sweet switch? Are you ready for a sweet switch? I'm all about trying new things, especially when it means switching from something that's high in sugar and really not good for my family. That's what really got me interested in trying products from the Rigoni di Asiago line. They offer a growing variety of products that you can use to replace everyday things like sugar, chocolate-hazelnut spreads, and sugar packed fruit spreads. The thing I really like is that you don't have to sacrifice taste when making the switch. Rigoni di Asiago prides themselves in making sure they achieve the healthiest and tastiest products that are both good for you and respect nature at the same time. Now to me that says something about them as a company. And having tried several products in their line now I have to agree the taste is definitely not being sacrificed. And in some instances I actually thought their products gave my foods an even better overall flavor. Want to try new products like these but aren't sure how to get started, or how to use them? Don't worry I felt the same way when I first started too. By visiting the recipe section of the Rigoni di Asiago website you'll leave with lots of new ways to swap the old and start using the new! Dolcedì’ is a new, all-natural liquid sweetener that’s made from 100% organic apples and is a low-glycemic* alternative to sugar and other sweeteners. With 25% fewer calories than table sugar and higher sweetening power (you just need ½ tsp vs. 1 tsp granulated sugar) Rigoni di Asiago Dolcedì’ is made from the concentrated and filtered sugar extracted from organic apples. It is certified USDA organic, non-GMO, gluten-free, vegan, and STAR-KOSHER. Nocciolata is a chocolate-hazelnut spread with an undeniably superior flavor and smooth texture. Each batch takes 36 hours of artisanal preparation, which combines top-quality hazelnuts, cocoa and cocoa butter, environmentally-responsible cold-pressed sunflower oil, natural vanilla extract, raw cane sugar, and skimmed milk. Unlike other chocolate-hazelnut spreads, Nocciolata contains no palm oil (which is high in saturated fat and whose cultivation devastates the environment), hydrogenated fats, artificial colors, aromas or additives. Most recently, they have also developed Nocciolata Dairy Free, a certified vegan version of the original perfect for those who follow a vegan lifestyle or are lactose intolerant. 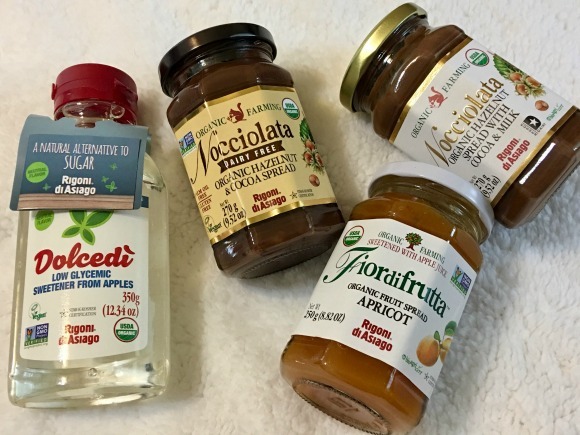 Fiordifrutta contains over three pounds of perfectly ripened organic, non-GMO fruit in every jar and is sweetened with only organic apple juice (no sugars added). A low-temperature production process not only best preserves the nutrients and flavors of the fruit, but also significantly reduces the natural sugar content, yielding 30% fewer calories than most other brands. It is the only three ingredients (fruit, apple juice, and pectin) fruit spread on the market and is available in a wide range of flavors from classic (including Raspberry, Strawberry, and Wild Blueberry) to exotic (Pink Grapefruit, Black Currant, Seville Orange, and Pomegranate, to name a few). Dolcedì does sound very interesting to try. I would really like the Nocciolata product also to put on an English Muffin!